Take to the off road in style as you are let loose in an American Spec Monster Truck! With a 7l engine and 6 foot tyres, you won't believe the awesome power of these mammoth motors. Experience the gigantic nature of driving a Monster Truck with this magnificent foursome, allowing you to get up close and personal with a range of varying sizes of truck - from standard 4x4 right up to the Grizzly - which has 6foot tyres and an enormous 7.5L engine! You'll be driving an off road buggy through a wooded forest, a Land Rover through the same forest - and 2 huge monster trucks, including the massive American Spec Grizzly! Enjoy this giant experience responsibly! Your Maxi Monster Experience will begin with a welcome and safety brief, covering the driving skills and techniques to be employed on this great off road driving day. Then, once briefed, you'll be ready to hit the mud for the first instalment of this awesome foursome - driving the Grizzly, the 'Black Ice' (Euro spec truck) the Land Rover and the 4x4 Buggy. 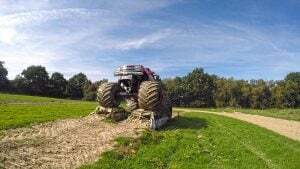 You will be challenged with driving each Monster Truck over the muddy course before taking the 4x4 vehicles onto a whole new course, with steeper slopes and muddier mounds! You'll even be driving over police cars in the giant Monster Trucks! The Maxi-Monster Truck experience is available on selected weekend dates from February to December. These times and dates are subject to change and availability at the time of booking. Driving License isn't required, but participants must know how to drive. Please contact us if the participant does not fit the advised guidelines, as it may still be possible. The experience will last for 2.5 hours. Actual Driving Time: Around 40 mins per person. Participants: The Maxi-Monster Truck Experience is for 1 participant. 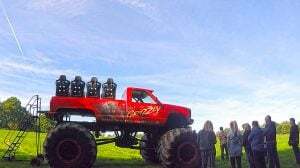 The Maxi-Monster Truck Experience runs with up to 3 people per session. Up to two spectators are welcome on the day. Spectator rides are possible, subject to sign on. There is no indoor viewing area and the site is not very suitable for young children. Please wear comfortable clothing that you don't mind getting a little dirty. The ground is muddy with some puddles in the winter, so don't wear your best loafers! This experience will only cease to operate in extreme weather conditions (such as deep snow and hurricanes). However, if you are worried, please check with the centre before leaving. The Monster Truck experience was fabulous - I bought it for my son for Christmas and it was a great day of monstrous wheels, turning over vehicles and mad stuff. The staff were great and the venue perfect. I had a fantastic day enjoying the big kids toys! This was a Birthday present from my hubby. He knows that ever since I was a little girl I have always wanted to drive a monster truck and this experience did not disappoint. First I did some off-road super mud-bashing 4x4 driving in a Land Rover, next was the UK specced big truck and some basic monster truck handling. Next was the show stopper, the Grizzly! It is the only US-specced Monster Truck in the UK and is frankly massive! I got to drive it as fast as I dared, and even got to crush a couple of cars, whilst posing for the ultimate action picture! To round the day off, I even got to drive an ATV through a challenging off-road course then roll it over onto it's roll cage! What more could a girl want? A big thanks to the instructor on the day (I apologise I forget your name!). He was courteous, patient, humorous and extremely knowledgeable. Without him in fact, the experience would have only been 99% as good. We travelled from north Essex to participate and I can honestly tell you it was absolutely worth the journey. I really recommend it, and for the money (my husband spent!) it's a magnificent couple of hours that you will never be able to replicate anywhere else. Definitely worth it! Would have liked longer on the Monster Truck and the course to have been a bit more adventurous. Pity as this was the main attraction. The other activities and course route wre more to expectations. 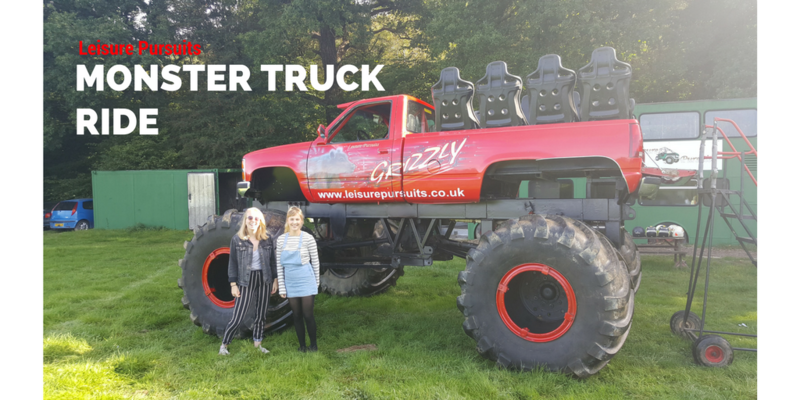 Last weekend we had the amazing opportunity to meet Grizzly – the 4.5 tonne, 7.5 litre V8 Chevrolet Monster truck! She has 5ft 5inch wheels and can crush cars, fly over mounds, climb steep hills and make great speed. Grizzly is a genuine retro American-born ’96 model Chevrolet Silverado, and can get up to 1700 horsepower when racing. We chose the passenger ride experience, but you can also learn how to drive Grizzly yourself and share the driving experience with others! We set off from Brighton and drove to Blackland Farm in East Grinstead, which despite being in the country was surprisingly easy to find. Blackland Farm is a large activity centre site with several other activity centres in the same area. This gave it a friendly and exciting atmosphere. Leisure Pursuits’ meeting point was clearly sign posted and we made it down to the designated car park where we were met by one of the instructors, Daryll. He took us down to the site in a 4×4 Jeep through the forest. We didn’t drive for long but it was still a fun experience as the Jeep was very bumpy, and it got us even more excited for the Monster Truck! The site was a huge open field on one side of a small forest featuring a stationary bus, which contained a seating area and fresh tea which we were encouraged to help ourselves to. Once everyone had arrived, we were taken through the different parts of the truck and were briefed on the history of how Grizzly got to the UK. Believe it or not, Grizzly has made appearances in several TV shows and adverts, including ‘Don’t Tell The Bride’, ‘The One Show’, ‘Top Gear’ and the recent ‘McDonalds’ advert. Once we knew more about this world famous American classic, it was time for the safety briefing. We were provided with helmets and shown into our seats. There were eight seats in the back of the truck and as a kind gesture I was lucky enough to sit in the front next to the driver! The rest of the group got in by climbing a tall ladder, showing off just how tall the truck was. Feeling a little nervous, and not knowing what to expect of the ride, we were off before we knew it! Tim (our driver) put his foot down and floored it – the monster truck raced over the huge hill and as the grass was wet we skidded here and there which made the whole experience even more exciting. 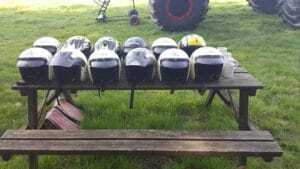 Our adrenaline was pumping as we drove through ditches, over steep hills and in-between fields, making sharp turns left and right to give us that true ‘roller coaster’ style ride. The best bit was saved for last as we drove over two cars! Making our way back to our set off point, hearts still pounding and faces aching from smiling, we were so excited to have experienced such an amazing Monster Truck ride. Huge thank you to Daryll and Leisure Pursuits for a fantastic day in the countryside, and to Grizzly for being such a lovable beast! There are plenty of monster truck experiences available, from drives to passenger rides to off-road combos, you’re guaranteed to find the ultimate grizzly gift that’ll never be forgotten. Can you divide the drive time between your friends for the Maxi- Monster Truck Experience? Yes for the Maxi- Monster Truck Experience the voucher can be used for a maximum of two people. However, the voucher entitles you to drive four vehicles and therefore you would only be driving two vehicles each. How much drive time do you get with the Maxi-Monster Truck Experience? You will receive 40 minutes of drive time when taking the Maxi-Monster Truck Experience.